Well-Being Systems emerge from the complex interactions of four key components as illustrated in Figure 1 below. Figure 1. The Universal Well-Being System. Before I define each of the key constituents of this model I need to provide some framing about my terminology. I purposefully tried to choose commonly used words for each of these constituents, rather than more “scientific,” jargon-laden terms. I wanted words that might be readily recognized and understood by a wide readership spanning both the social and biological sciences. There is an obvious advantage to this approach. The goal of language is effective communication; it is always easier to communicate with a person if he does not have to constantly refer to a glossary to understand the words used. However, there also is an inherent danger in using common terms. All these words already come with a variety of meanings, particularly key terms like Choice, Need and Well-Being. Each has a long history of vernacular use. These terms also have a long history of use within the social sciences, humanities and biological sciences; though interestingly and significantly there are no universally agreed upon definitions for any of these terms. I would implore the reader to try to set aside prior conceptualizations and understandings of these terms and think about them only in the specific ways I define them here. Choice: Is the active response to Self-Related Needs and selection between options. I use the term choice to include selections that involve both conscious agency, but also those decisions processed unconsciously, including choices that other theorists have categorized as “instinct.” Even “instinctual” choices arise through active selection of options and are subject to change and manipulation. Also important to appreciate is that the most frequent choices people make are the “choices” to continue doing the same thing they are currently doing. In humans, choice-making typically though not exclusively involves some kind of neural processing. Actor: Are structures, they can be nerves, muscles or a whole person that respond to choices. Actions typically involve physical responses, ranging from simple movements to more complex behaviors, but actions can and do happen at every organizational level, from the biochemical to the collective efforts of groups of people. (Self-Related) Need: Is a perception of an underlying state; a threshold-like, regulatory “construct.” Perceived needs can be based on either an actual physical entity such as a molecule or possession, but they can also be based on totally abstract, entirely mental constructions such as a relationship or an idea. Whether physical or mental, individual or social, Needs are always self-referential, always framed in relationship to the balance of a person’s perceived requirements as compared with some intended internal or external reality. Sensor: Are bodily structures that take in information and are capable of perceiving the status of Self-Related Needs relative to the internal and external environment. Some sensors are externally focused such as eyes and ears but others are internally focused, attuned to electrical and biochemical signals coming from the gut or circulatory system. Well-Being: Is a dynamic system, designed to sustain a balanced state representing an optimal satisfaction of Self-Related Needs, monitored by Sensors, regulated by Choice and maintained through Actions. Well-being, in particular short-term well-being, has evolved as a perceptible proxy for fitness. People perceive Well-Being when they feel they are healthy, part of and appreciated by their group, physically safe and secure and intellectually and spiritually satisfied. Perceived states of Well-Being generally correlate with enhanced survival. From the beginning of life, homeostasis has functioned using the following basic process (Figure 2). 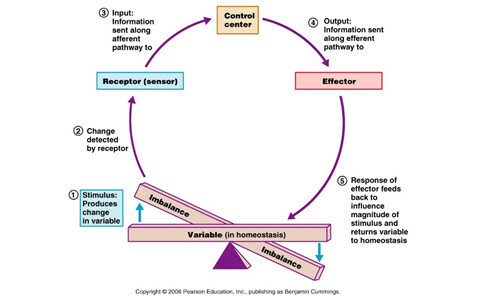 It is not an accident that this diagram of homeostasis looks surprisingly similar to my Well-Being System model; all Well-Being Systems are homologous with homeostatic systems. Well-Being Systems, like homeostatic systems, are complex systems that evolved to phenotypically regulate the well-being of organisms by affecting appropriate responses to the perceived environment. [xxiii] Although the evolutionary origins of homeostasis are hypothesized to have been mechanisms designed to maintain appropriate balances of single chemicals,[xxiv] life ultimately evolved a wide range of similar systems for dealing with ever more complex physiological needs; each new system functioning independently, yet interconnected within the larger complex of physiological regulating systems. [xxv] I assert that the evolution of homeostatic-like systems did not end with physiological processes. Through successive exaptations,[xxvi] these Well-Being Systems evolved to support organismic regulation at every biological level – the molecular, cellular, organ, organism, social, community and potentially beyond. [xxvii] This means that even the simplest cell is comprised of hundreds if not thousands of homeostatic/Well-Being Systems. Over evolutionary time, life utilized the basic genetic and biochemical machinery of homeostasis to build other well-being maintaining systems; each new system utilizing the same basic, multi-step process of sensing need states, making choices, effecting appropriate actions, and then judging the consequences of that cycle again on the state of some self-related need variable such as temperature, safety, belonging or a new solution to a problem. The result is that life itself can be thought of as a complex adaptive system comprised of trillions upon trillions of highly interconnected, nested, functionally similar, but not identical Well-Being Systems. [xxviii] The functioning of all such systems, from the simplest chemical regulation within a cell to the most complex control of an entire organism within a dynamic ecosystem across space and time, involve continuous adjustments in order to remain successfully attuned to the needs of an ever-changing environment. [xxix] Thus it is that within every human, trillions upon trillions of Well-Being Systems are simultaneously cycling along, perceiving needs and enacting choices; virtually all happening outside of human conscious awareness. The following represents a distillation from a forthcoming book, Falk, J.H. (in press). Born to Choose. New York: Routledge. Leotti, L.A., Iyengar, S.S. & Ochsner, K.N. (2010). Born to choose: The origins and value of the need for control. Trends in Cognitive Sciences, 14(10), 457-463. e.g., Nozick, R. (1990). A normative model of individual choice. New York: Garland Press. e.g., Jeannerod, M. (2003). The mechanism of self-recognition in human. Behavioral Brain Research, 142, 1-15. Wegner, D. (2002). The illusion of conscious will. Cambridge, MA: The MIT Press. cf., Torday, J.S & Miller, W.J. Jr. (2016). The phenotype as agent for epigenetic inheritance. Biology, 5, 30; doi:10.3390/biology5030030. e.g., Ryff, C. D. (2014). Psychological well-being revisited: Advances in the science and practice of Eudaimonia. Psychotherapy & Psychosomatics, 83(1), 10-28. A large number of wide-scale surveys and assessments of well-being, typically referred to in the psychological literature as “subjective well-being” have been developed. These assessments have now been administered to individuals, groups and even whole nations (e.g., Hicks, S. (2012). Measuring subjective well-being: The UK Office for National Statistics experience. In Helliwell, J. F., Layard, R., & Sachs, J. (Eds. ), World happiness report. New York: Earth Institute; Helliwell, J., Layard, R. & Sachs, J. (Eds.). (2016). World Happiness Report 2015. New York: Earth Institute. http://worldhappiness.report/wp-content/uploads/sites/2/2015/04/WHR15.pdf Retrieved December 8, 2016; Diener, E. (2015). Subjective Well-Being Scales. https://internal.psychology.illinois.edu/~ediener/scales.html Retrieved December 8, 2016. Importantly, this idea of making a judgment, in essence taking abstract information and converting into actionable information is the very essence of all Well-Being Systems, from the most fundamental homeostatic systems all the way through the most complex creative systems responsible for driving scientists to try and understand the natural world. Defining biological systems using such seeming metaphorical definitions makes many scientists uncomfortable. For example, critiques by Tauber (Tauber, A.I.,(1994). The Immune Self: Theory or Metaphor?, New York and Cambridge: Cambridge University Press) and Pradeu and Carosella (Pradeu, T & Carosella, E.D. (2006). The self model and the conception of biological identity in immunology. Biology and Philosophy, 21, 235-252) have specifically taken issue with the longstanding use of the self-non-self metaphor to describe immunological processes. Although these authors raise some interesting issues, ultimately these and other critiques are predicated on the argument that something like self-perception cannot exist because it would require that living organisms, including simple one-celled creatures like bacteria were capable of dealing with abstractions, rather than the actual concrete realities of real life; in other words chemistry and physics. Blouin-Hudon, E-M. & Pchyl, T. (2015). Experiencing the temporally extended self: Initial support for the role of affective states, vivid mental imagery, and future self-continuity in the prediction of academic procrastination. Personality and Individual Differences, 86, 50-56. Ersner-Hershfield, H. Elliott Wimmer, G. & Knutson, B. (2009). Saving for the future self: Neural measures of future self-continuity predict temporal discounting. Social Cognitive and Affective Neuroscience, 4(1), 85–92. Mischel, W. (2014). The marshmallow test: Conquering self-control. New York: Little, Brown. e.g., Vincent, T. (2005). Evolutionary Game Theory, Natural Selection, and Darwinian Dynamics. Cambridge, UK: Cambridge University Press. Martin, W. & Russell, M.J. (2003). On the origin of cells: A hypothesis for the evolutionary transitions from abiotic geochemistry to chemoautotrophic prokaryotes, and from prokaryotes to nucleated cells. Philosophical Transactions of the Royal Society of London, B-Biological Sciences, 358(1429), 59–85. Prigogine, I. & Nicolis, G. (1977). Self-Organization in Non-Equilibrium Systems. New York: Wiley. Woese, C. (1998). The universal ancestor. Proceedings of the National Academy of Sciences, USA, 95(12), 6854-6859. Torday, J.S. (2015). Homeostasis as the mechanism of evolution. Biology, 4, 573-590. Cavalier-Smith, T. (2004). The membranome and membrane heredity in development and evolution. In R. P. Hirt and D. S. Horner, eds., Organelles, genomes and eukaryote phylogeny: An evolutionary synthesis in the age of genomics, pp. 335–351. Boca Raton: CRC Press. Jablonka, E. & Lamb, M. (2014). Evolution in four dimensions: Genetic, epigenetic, behavioral and symbolic variation in the history of life. Cambridge: MIT Press. Cummings, B. (2006). Pearson Educational Publishing. Torday, J.S & Miller, W.J. Jr. (2016). The phenotype as agent for epigenetic inheritance. Biology, 5, 30; doi:10.3390/biology5030030. It is speculated that the first homeostatic mechanism was designed to regulate calcium concentrations in the primordial cell. Kamierczak, J. & Kempe, S. (2004). Calcium build-up in the Precambrian seas. In J. Seckbach (Ed.) Origins, pp. 329-345. Dordrecht, The Netherlands: Kluwer. cf., Gould, S.J. & Vrba, E.S. (1982). Exaptation – a missing term in the science of form. Paleobiology. 8(1), 4–15. It should be noted that I am certainly not the first person to see a connection between homeostasis and higher order processes, including human psychological functioning (e.g., Cofer, C N. & Appley, M. H. (1964). Homeostatic concepts and motivation. In C N. Cofer & M. H. Appley, Motivation: Theory and Research (pp. 302-365). New York: Wiley). But most of these early applications of homeostatic processing to human behavior were based upon Behaviorist frameworks and assumed that humans mechanistically and rigidly responded to the environment analogous to the way a thermostat responds to changes in temperature. These early models also did not account for the diversification and radiation of these homeostatic-like processes into the wide array of new, evolutionarily connected but functionally novel forms that humans now display, including at the social and analytical levels. It is not a stretch to think of Well-Being Systems as having fractal-like qualities, appearing as suggested by John Torday (Torday, J. (2016). The cell as the first niche construction. Biology, 5, 19-26.) at every level of biological organization, subcellular to cellular to tissue to organ to organism to social system, potentially all the way up to the Gaia-like level of ecosystems. Torday, J. (2015). Homeostasis as the mechanism of evolution. Biology, 4, 573-590. 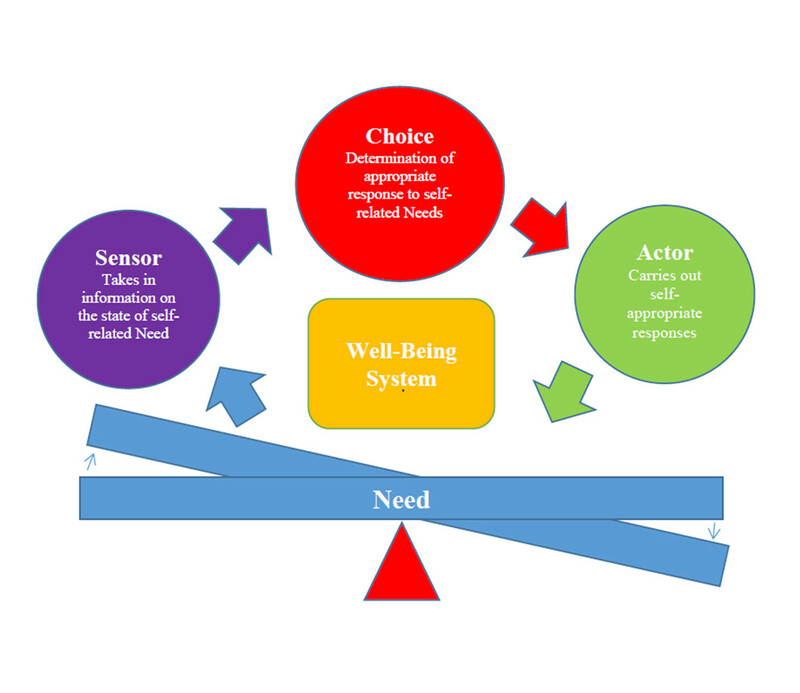 As stated above, these seven interconnected but functionally discreet modalities of Well-Being Systems reflect my best effort to build on previous theory and synthesize available evidence. Four specific sources are discussed below. Relationality is the generic term historian of philosophy Jerrold Siegel uses to describe this class of self-related perceptions (Siegel, J. (2005). The idea of the self: Thought and experience in Western Europe since the eighteenth century. Cambridge: Cambridge University Press.). Over the past few decades scientists have become aware of the fact that every human is host to a massive array of microbes living on the skin and throughout the body. In fact, it is now estimated that there are more than ten times as many genetically unrelated “selves” living within a person than genetically related ones, and although each is microscopic and weighs virtually nothing, if combined they would weigh about 6 pounds. Adami, C., Ofria, C. & Collier, T.C. (2000). Evolution of biological complexity. Proceedings of the National Academy of Sciences (USA), 97, 4463–8. A fuller, more neurologically justified explanation is available in Falk, J.H. (in press). Born to Choose. New York: Routledge. As also suggested by Torday (Torday, J. (2016). The cell as the first niche construction. Biology, 5, 19-26).